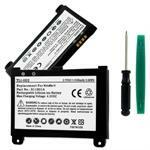 TLI-002 : 3.7volt 1530mAh Li-ION battery for KINDLE 2 (3G) Tablet, KINDLE DX (3G), KINDLE S11S01A, and KINDLE 170-1012-00. TLI-003 : 3.7volt 1530mAh Li-ION battery for KINDLE 2 (WiFi), S11S01B, etc. TLI-003 : 3.7volt 1530mAh replacement Li-ION battery for KINDLE 2 (WiFi only), Amazon S11S01B, KINDLE D00701, KINDLE D00511, KINDLE D00611, B003B0A294563B74. Includes tool set. 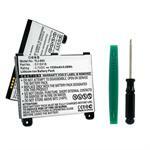 BP-D01100 : 3.7v 890mAh Li-PO battery for Kindle 4, Kindle 4G, Kindle 5, Kindle 6. Includes battery + assembly tools. Replaces original internal battery. TLP-004: 3.7volt 1830mAh Li-ION battery for KINDLE 3, 3 WiFi, 3G, Graphite etc. TLP-004: 3.7volt 1830mAh Li-ION battery for KINDLE 3, KINDLE 3 WiFi, KINDLE 3G, KINDLE Graphite, KINDLE III, KINDLE Keyboard; Amazon 170-1032-00, Amazon B006, Amazon B008, Amazon B009, Amazon B00A, Amazon D00901, GP-S10-346392-0100, S11GTSF01A.